Alexander Nagiba was born and raised in the former Soviet Union. A native Ukrainian, he started his ballet training at age 8 with famous Russian teachers. In his youth, Mr. Nagiba performed at the Bolshoi, Kirov and Kremlin Opera Houses. In 1980, Mr. Nagiba immigrated to the United States. He then continued dancing with American Ballet Theater II and joined Pittsburgh Ballet Theater in 1985 where he was promoted to soloist in 1989. 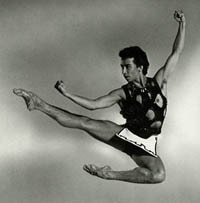 Throughout his career with PBT he received rave reviews for his technique, artistry and dramatic ability including those from prestigious sources such as the New York Times, Philadelphia Inquirer and Dance Magazine. Mr. Nagiba's career included works from classical, contemporary and Balanchine ballets. His many principle roles include Romeo, Mercutio and Benvolio from Romeo and Juliet, Puck from A Midsummer Night Dream, Basilio and Espada from Don Quixote, Franz in Coppelia, Petroushka in Petrouska, Cavalier and Snow King in The Nutcracker, Bluebird and the Prince in The Sleeping Beauty. His more contemporary parts included leading roles in Cinderella, Dracula and Configurations, a ballet made famous and choreographed for Michael Baryishnikov by Choo San Goh. His Balanchine ballets include the title character in Prodigal Son, Allegro Brilliante and leads in Rubies and Emeralds in Jewels, Symphony in C, Western Symphony, Square Dance, Tarantella and many others. His work has earned him a place in the Balanchine Archive in New York City, documenting Square Dance with Laura Desiree and Patricia Wilde. During his career, Mr. Nagiba has had the opportunity to work with well known dancers, teachers, coaches, directors and choreographers from around the world. Thes include Patricia Wilde, Terrance Orr, John Tarras, Victoria Simon, Marianna Tcherkasky, Bruce Wells, Ben Stevenson, Lynn Taylor Corbett, Ib Anderson, Helgi Thomasson and Michael Baryshnikov, as well as others. In 1996, Mr. Nagiba won the first annual Excellence in Arts Award for dance from Pittsburgh Magazine. Mr. Nagiba has been teaching all age levels including professional company classes for the last nine years. He has taught for Pittsburgh Ballet Theater School and for Pittsburgh Ballet Theater, Pittsburgh Youth Ballet, Point Park College, Rogers School of Dance and many others. With his 30 years of experience, Mr. Nagiba's goal is to continue the high quality of education at VBTS and lead the students towards a professional standard while teaching them artistry, integrity and the love of dance.